Early on in this site’s life, I was called a “data crazed fanatic completist” by someone reviewing my site. That’s one of the more inventive things I’ve been called, so that phrase has always appeared on the site since I first heard it. It’s part of the reason why I was driven to make sure the timeline page was so complete and cover everything. It’s that drive that has kept the site going all these years, and also extends over into other parts of my life. I’ve been a CD collector for longer than I’ve been doing this site. Got my first CD in 1984 (Bruce Springsteen’s Born in the USA). I actually didn’t get my first CD player until a Christmas present in 1987. The first CD I bought after getting a player for Christmas was Black Sabbath’s “Eternal Idol” album. Since then, my CD collection has grown rather a lot. Over the years, I’ve had a few purges, where I sell them off, but I still have a pretty sizable collection. If I never purged, I’d probably have double what I have now. Some years ago I made this series of pages, where I catalogued my CD collection. An old friend of mine (Hi Baskinator) suggested that. It was cool, but a pain, since it was all manually created (again, hello Frontpage!). I upped the ante a bit later on and made it a blog in Movable Type. That worked well, the automation was nice, but it was still lacking the level of detail I was wanting to put in there. So I started looking around for software that could do this. 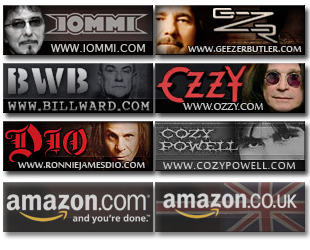 I happened upon an ad banner for the Collectorz.com music catalog software. They actually have several pieces of software, ones for music, movies, books, videogames.. But in this case I was interested in music. So I grabbed the demo to check out. I was quite pleased with the stuff. I immediately purchased it, and set upon putting my CD collection in there. As you can see, pretty basic catalogue information. Album, cover art, track listing. But that’s about the end of “shallow”. Take a look at the first page of album detail for this. Just on this page, you can see a level of detail that goes way beyond what I’ve run into in other cataloging software. Just about every list can be customized with your own data. The software can handle the concept of Wish Lists – stuff you want but don’t have. It also has a “Not in Collection” option, which I use for things I sold and no longer have. That way you can have a record of what you got rid of. Wish I had that feature years ago. You can get down to individual track listings with customization. Each track can have its’ own data – That’s especially useful if you’re talking about a compilation and it’s all different artists. There’s lyrics, you can link to audio files and play them from the program. There’s also a lot of personal information you can put in here too. Check out this screen. This all reminds me, this program is not just for Compact Discs – this program catalogs mp3/m4a/whatever (just not iTunes old DRM files). Which is cool in this day when more purchases are digital, and not physical media. I still prefer physical media myself. Which brings up another thing. The way you get data into the program. You can either manually enter it (ugh), or use the databases out there. You can scan a barcode (if you have a scanner that can do that), or you can enter the UPC code. The folks who run this software maintain a pretty good back end database of CD data to use when populating entries. Goes way beyond simple Gracenote track listings. However, the way I found that works best is to physically put the CD in the drive, and it will scan it, grab the CDID#, and match from THAT. That way you can get your precise version (if they have it ). This is useful when there’s something that has been pressed on CD a ton of times, and you want YOUR version, not that one from 10 years previous. I prefer that method of data entry, although I’ve used ’em all. Once you get your data in there, you can do some cool reporting, provided you bothered to populate your entries with the right info. For example, it should be pretty obvious who I have the most CD’s from by band name. Look at this chart. The depth of information possible in this software is staggering. 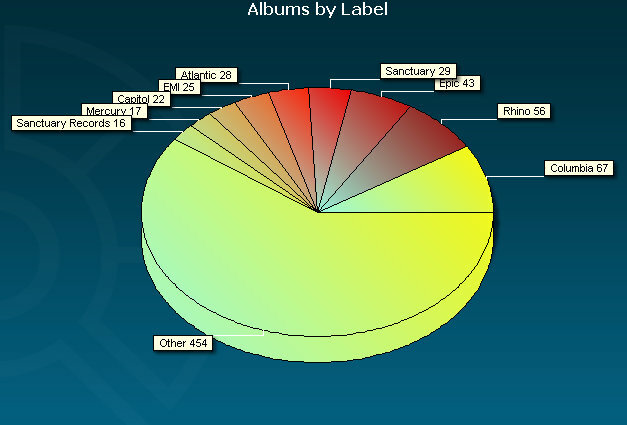 If you want to read more about the features and the data and all that, head over to the CLZ Music site, where you can read a lot more. I can’t say how much fun this is for me. 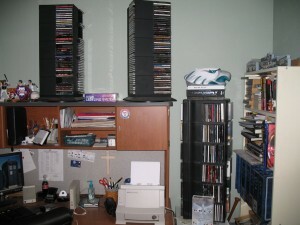 I’ve entered all my CD’s & DVD’s/BluRays into this system, and I like the organization of it. It speaks to my need to keep data in order. It might seem weird to some people to ENJOY this kind of data structure. But I know I do. Even if you don’t want to fill out every last data field (and good Lord, there’s a ton), it still helps keeps things together. They also have iPhone & iPad apps to help you access your collection on the go. They have scanner apps, check it all out at their site. I really love this software, and when I was putting the site together, I thought about how I could run some promotions. The contest giveaways are a usual item here, but I wanted to do something with this software, mostly because I’m personally a fan of it. Not like some places that are paid to push things. I really honestly use this stuff, and paid for it out of my own pocket. So I contacted the folks at CLZ and told them what I had in mind. Said I’d write a review on the software, and they were quite gracious to extend an offer to you, the site visitor here. 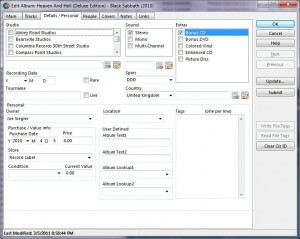 Through February 1st, 2012, if you order CLZ Music through them, you can get $10 off with the coupon code CLZPARANOID. Just order the software, and when you check out, use the coupon code for your discount. You can go grab a free trial version now to check out – click the banner image below. But if you decide to buy, do so by Feb 1st, and you’ll get $10 off your purchase using that special coupon code. Thanks a ton to Sytske & Alwin for graciously allowing my site visitors a discount. Hope I send you a few customers! You can read more about the people behind the software on this page. Admin Note: One of the things I intend on doing with this new version of the software, is write more music articles on my own. Not strictly Black Sabbath “news”, but items of interest. Hence the category “From Joe’s Mind”. I’m leading off this concept with this review. Great website, love the new look /m/ !!!! I would like to say I am a huge FAN of the SABS, I would like to think I have one of the best collections of SAB related material in my area, most store bought ( not ebay). First concert EVER 1984 Born Again Tour in Chicago. Many stories to tell and share. Sabbath changed my life forever and still does to this day. Get well Tony Iommi /m/ and THANK YOU JOE !! for this forum . 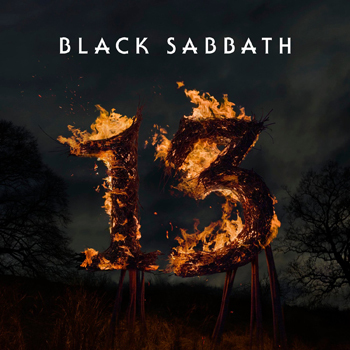 BLACK SABBATH IS GOD !! This new site is amazing. I’d love to see more articles like this one! Joe, what a great review for the Collectorz database. I like you was struggling to keep my CD list up to date – over 1350 now and DVD’s – close to 400 (I was using Word and typing all critical info in) and I found this database and have been in love with it ever since. I am one of those you spoke about, who slowly but surely updates all the fields in the database, I do not use the Connect feature, but I do have the iPhone/iTouch apps, which has been a lifesaver when out purchasing stuff. Thanks again for the review. BTW, Paranoid and Born Again (Deluxe Edition) are my two favorite releases. Although Heaven and Hell was awesome – while Fairies Wear Boots and War Pigs are my two favorite tracks. Can’t wait for the new release and tour. Highly anticipating their tour in Europe. Thanks a lot for the heads up on this! I’ve somewhere around 1500 CDs/DVDs and counting, so I’m definitely looking into it. New site looks great btw! Thanks for the information Joe. This is something that I have been looking for. I am also an analytical nerd and have been wanting to catalog my collection for years. Quick question, did you purchase the Standard or Pro Edition? Was there a significant difference to make your decision? thanks for this tip….spent all weekend entering data! and i havent even started on the vinyl……. 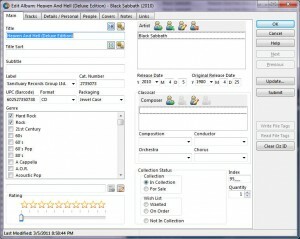 the pro edition dan will export to a csv and some other features, which swayed me towards it. being able to stick it into excel makes for a backup you can stick on a smartphone and carry around if like me your often in the shop wondering …Have i got that one???? I have this software as well and I’m with Joe. It’s great! I’d add that Collectorz is a small company with dedicated and responsive employees. I’ve entered comments in the forums and gotten quick responses from the president of the company. If you need help with issues not covered in their help database, you’ll receive quick e-mail support.